Loquat is an small, oval, pale yellow to apricot-orange fruit that grows on an evergreen tree that also bears dark green, dramatically beautiful leaves. The fruit is prized for its delicate flavor, sweet with an accompanying tartness. Extract from the leaves have been used for centuries in traditional Chinese medicine to help the lungs, walk into any Chinese medicine store and you’ll see a row of honey loquat syrup bottles. In Hawaii, these trees can be found mostly growing in backyards. Only a few farms grow them in limited quantities, a short season at the end of winter – usually sometime in March. – To eat, just wash it and savor! – Some peel the skin, others eat the whole thing. – Careful not to eat or bite into the seeds (most loquat have 1-3 shiny brown seeds in them), they are not for eating. – Loquat can also be used to make salsa, sauces, preserves, pickled, and in baking (cobblers, tarts). 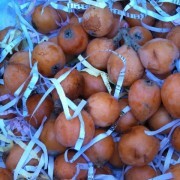 Select loquats with free of bruises and blemishes, with smooth and unbroken skin. Loquats be brown or have freckles, this is due to a weather factor and doesn’t affect their flavor. They damage easily, so if you have to store, let them sit without touching, unwashed, in a sealed container in the refrigerator. They can last up to a few weeks chilled, but best to eat when fresh for optimal taste and nutritional value. According to famous Hawaii fruit farmer, Ken Love’s, Hawaii Fruit website “For many years only the Chinese royalty was allowed to eat the fruit, as it was thought that loquat fruit falling into the rivers gave the koi, or carp, the strength and desire to swim against current and up waterfalls and be turned into mythical dragons.” It is thought that loquat migrated to Hawaii from China, planted in the yards of laborers from China as early as 1787. Check out Hawaii Fruit farmer Ken Love’s paper on growing loquat in Hawaii.